Before starting this GIFT authoring guide, please make sure you have a fully functioning GIFT instance. “Surveys” provide a way for the GIFT system to obtain additional information about the user. From domain independent to domain dependent questions and from knowledge probing to biographical information, each response can be analyzed and used to improve learning. Essentially, the term ‘Survey’ refers to a test (pre-test, post-test, etc.) or assessment item (psychological survey, personality survey, etc.). Currently surveys are retrieved from the GIFT UMS database and presented during the execution of a course through the Tutor User Interface (TUI). Surveys can be authored through the Course Creator (also called the GIFT Authoring Tool or GAT). We suggest you explore existing courses, now called Showcase courses, that are available both on GIFT Cloud and in the downloadable GIFT release for examples on the types of questions and surveys that can be authored. For more information, you can look at the various interfaces, or simply leaf through the preconfigured in the GIFT\config\sensor\configurations directory. Note the sensor module can only interact with sensors when running GIFT locally not on a server such as GIFT Cloud. The pedagogical module is responsible for providing instructional strategy request to the domain module. Currently the pedagogical module is configured on a per user per course basis using a pedagogical configuration file. The pedagogical configuration file should be authored using the GIFT Authoring Tool (GAT). This module currently contains two pedagogical models. The first is called the default pedagogical model. This model relies on the state transitions part of a Domain Knowledge File (DKF) to be configured. The second is called the interactive, constructive, active, passive (iCAP) model. This iCAP model is used to select the appropriate content for a learner based on learner state as well as historical data to help individualize the experience and improve learning gains as efficiently as possible. Domain knowledge is configured using a Domain Knowledge File (DKF) (also called real-time assessment). The DKF configures the assessment logic for a domain – more specifically for an instance of a training application such as a VBS scenario or PowerPoint show. Multiple DKFs can be used during a course as governed by the course. To author a DKF use the course creator (also called the GIFT Authoring Tool or GAT). For more information refer to the GIFT Domain Knowledge File document. Depending on your GIFT release, there maybe one or more DKFs already created and available. The course file describes the flow of the domain session. The flow of a course can be fixed or dynamic. A fixed course flow is simply one without an adaptive courseflow course object authored in the course tree for that course. 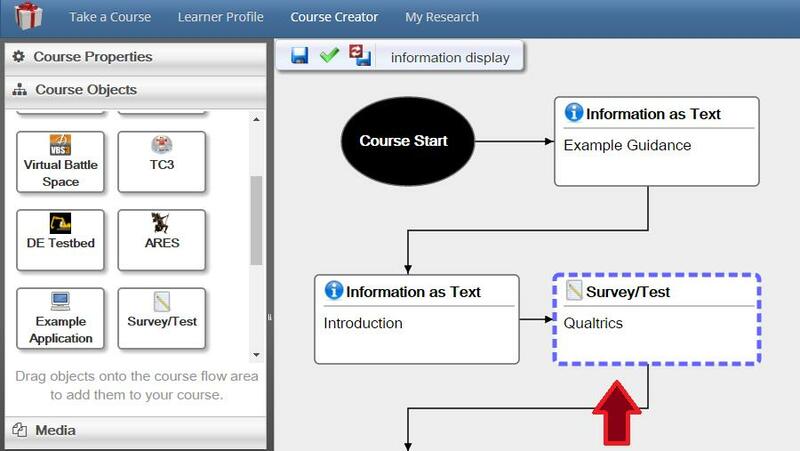 Whereas a dynamic or adaptive course specifies one or more adaptive courseflow course objects that use learner state characteristics and metadata to present appropriate content during the course. Depending on your GIFT release, there maybe one or more course files already created and available. For more information refer to the GIFT Domain Course File document. To limit the amount of procedures to maintain and to assure that this exercise works for each release, this authoring example has been combined with the GIFT release test procedures. To start this exercise open the GIFT Test Procedure Authoring spreadsheet (located in GIFT/docs/testing folder of a downloadable GIFT release) and select the “Overview” worksheet by clicking on the corresponding tab. Follow the procedures listed to author a GIFT session from scratch. Please take some time and read the Software Developers Guide at this time. If you are using GIFT Cloud (or another server based instance), when newer versions of GIFT are deployed to that instance the conversion will happen during the second two operations listed above. To import a course from another GIFT instance you will first need to export the course on that older GIFT instance using the course export button on the GIFT Dashboard (where the course tiles are listed on the 'take a course' page). Please keep in mind that if your GIFT instances has unique features that are not included in the newer version of GIFT (e.g. a software developer made changes for your project), your import will likely fail. 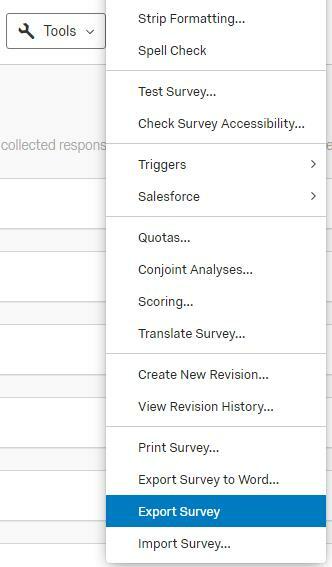 To import surveys that are not currently part of a course from an older GIFT to a newer GIFT instance you will first have to create a course that references those surveys (i.e. author survey course objects in the new course's course tree). Then export that course and import it into the newer GIFT instance.